Scooper - Technology News: Could populism spell the end of the EU? 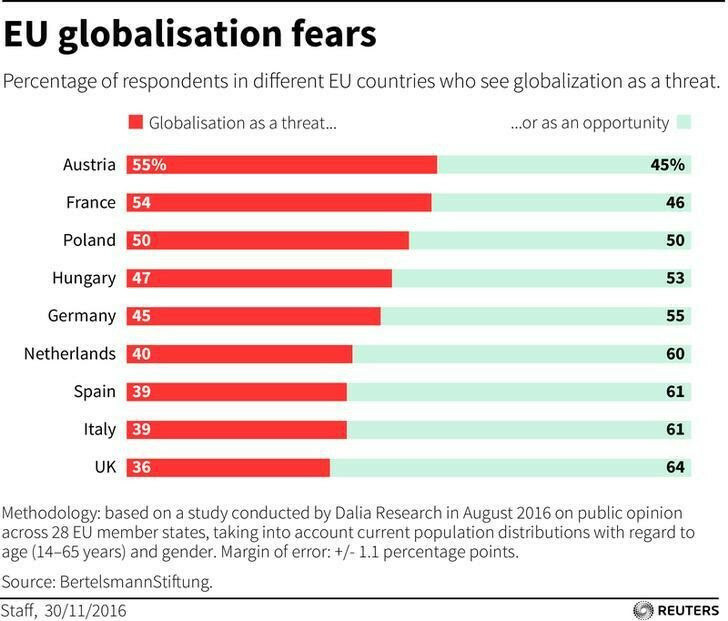 Could populism spell the end of the EU? Watch the Which Europe Now? session from the World Economic Forum's Annual Meeting 2017 here . Another year, another threat to the European Union’s survival. The good news is that the greatest disruption of 2016, Britain’s vote to exit the EU, appears manageable. The bad news is that both France and Italy face the prospect of a populist political takeover this year. Either outcome could well spell the end of the EU. To be sure, not everyone considered EU membership to be worth the sacrifice. But there was an air of practicality in popular criticism of the EU, which largely focused on what the EU did , especially in the economic sphere. That is why such criticism has been loudest in the countries that were hit the hardest by the euro crisis, or that faced austerity, or, more recently, that felt left behind by trade agreements. At a time of large-scale immigration, this shift is not surprising. Societies that have long defined themselves according to shared background and culture now must struggle with the implications of multiculturalism. That is why most observers of populist parties, especially of right-wing parties, have focused on attitudes toward foreigners and minorities. With the shift toward identity politics – a terrain that is not particularly amenable to compromise – has come a shift in attitudes toward democratic institutions. Populist leaders operate on the assumption that the will of the “people” – as defined by the populist – should not be institutionally constrained. This controverts the fundamental premise of liberal democracy: that the power of the majority must be limited, not least to protect minorities, electoral and otherwise. Limits on the power of the majority of the moment are typically achieved through what Americans call “checks and balances,” which include, for example, an independent judiciary and super-majority requirements to alter fundamental elements of the political system. And such limits usually work, at least for the most part. In the United Kingdom, for example, three High Court judges ruled that only Parliament – not the government – can trigger Article 50 of the Treaty of Lisbon, the formal process for leaving the EU. But populist politicians chafe under such constraints. Hungarian Prime Minister Viktor Orbán has not only openly stated his preference for an “illiberal” democracy ; he has worked to dismantle checks on his government’s power. The same goes for Poland’s populist government, whose de facto leader, Jarosław Kaczyński, doesn’t even hold a formal position in the administration. Given their contempt for independent institutions, it is not hard to see why populists oppose the EU, which is, in a sense, the quintessential liberal democracy: governed by impersonal rules, rather than by the majority of the moment, with most decisions requiring either a super-majority or unanimity. For populists, the EU represents significant added constraints that are even harder to push past than domestic checks. That makes it a problem. The reality, of course, is that democratically elected governments and parliaments install EU leaders and bureaucrats (and independent judges) precisely to place limits on the majority of the moment and future governments. But populists reframe their followers’ understanding of this system, by declaring that such officials are part of the “elite,” selected by their fellow elites to frustrate the will of the people. There is little that mainstream politicians, much less EU officials, can do to counter this narrative. Some national politicians succumb to popular pressure, adopting the rhetoric – and even the program – of their populist adversaries. But the EU can do no such thing, without effectively hastening its own demise. When the problem was what the EU did, there was a possible solution: the EU could change tack on economic issues. And, indeed, the Commission has de facto abandoned austerity. Likewise, the EU’s new trade deal with Canada, signed in October, was concluded only after working out elaborate compromises. But the EU cannot change what it represents. It cannot accept, much less advance, the notion that checks and balances are obstacles to progress, or that foreigners threaten the European way of life. It cannot offer the kinds of radical, impossible, or illiberal solutions that populists use to win support. The EU must remain a bulwark of liberal democracy, with all of its unsexy yet necessary rules and procedures. In the current environment, this lumbering embodiment of a multi-level democracy and open economy cannot compete with populists’ lofty promises. When populists fail to deliver, however, it is back to the EU that the public will run. One only hopes that there will still be an EU waiting for them.